After having visited Cambodia in August 1978 under the rule of the Khmer Rouge I had a good reason to return to this beautiful but stricken country. In November 2008 I was invited to show my old photos from 1978 with new comments and to come back with a new message. Since then the trial against some of the leaders has started and the head of the Tuol Sleng tortutre center has been sentenced to life in prison. This webiste is all bout what happened and what is happening in Cambodia today. For me, everything started with myself and others supporting the Khmer Rouge in the 70-ies and defended them. Part of this website is about how that could be possible. In August 1978 I belonged to a group from the Swedish friendship association with Cambodia - at that time called Kampuchea. This group made a visit to Cambodia. The country was at that time run by the ultra maoist Khmer Rouge under Pol Pot. . All private property was abolished, the cities emptied, money abolished and all religion was forbidden. At that time, I and many others, saw the revolution as something positive. I came home from this trip and praised the revolution. This was abominable. That is why I went back in 2008 - among other things to tell the victims how sorry I am for this. On this website you can follow both trips and thoughts from them and thoughts today. "Both Nuon Chea and Khieu Samphan participated in a joint criminal enterprise to achieve the common purpose of implementing a rapid socialist revolution through a ‘great leap forward’ by whatever means necessary. As a result, during the first phase of the movement of the population at least two million people were forcibly transferred from Phnom Penh in April 1975 by Khmer Rouge soldiers under false pretexts and threats, often at gunpoint, with almost no prior warning and in terrifying and violent circumstances. At the time of its expulsion, the population of Phnom Penh was severely weakened by the experience of a long siege characterised by food shortages. In this weakened condition, the population was forced to march to rural areas during the hottest time of the year and without adequate food, water, medical care, accommodation or transportation. Without exception, the entire population of Phnom Penh was evacuated, including monks, the old and the young, the sick and injured from the city’s hospitals, pregnant women and those who had recently given birth. 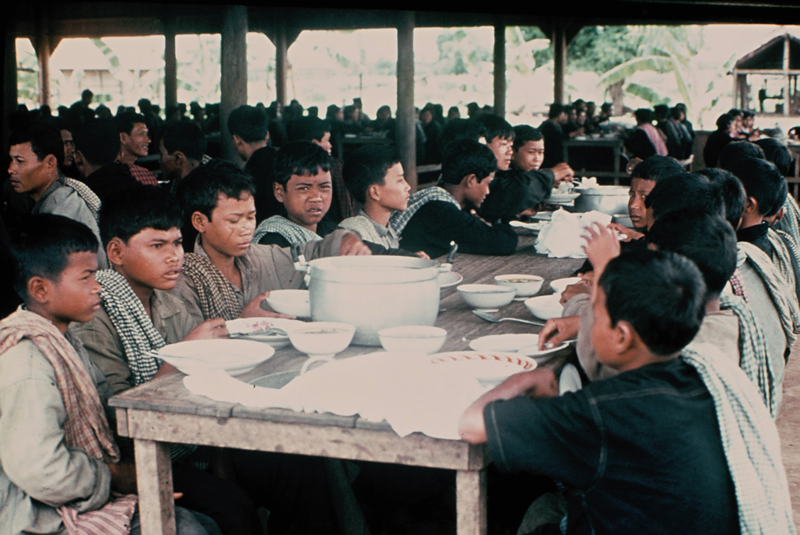 There were numerous instances of Khmer Rouge soldiers shooting and killing civilians during the course of the evacuation, while many others died of exhaustion, malnutrition or disease. The Trial Chamber also found that Nuon Chea and Khieu Samphan implemented the common purpose through a policy to target former Khmer Republic officials. As a result of this policy at least 250 Lon Nol officials who had been transported from Pursat to Tuol Po Chrey were executed. The Trial Chamber found a number of aggravating circumstances had been established: Nuon Chea and Khieu Samphan were well-educated and knew the importance and consequences of their actions; the crimes were committed in abuse of their positions of authority and influence; and many victims were vulnerable and defenceless), with limited mitigating circumstances." One of the accused leaders from the old Khmer Rouge leadership, Ieng Sary, died in hospital in Pnom Penh Marrch 14 2014. Ieng Sary was the Khmer Rouge Foreign Minister. He denied responsibility for the crimes he was accused of. Ieng Sary died 87 years old. Ieng Tirith, Minister of Social Affairs during the Khmer Rouge period, died in Pailin August 22.